"My mother learned how to make this while we lived in Nashville many years ago, and it is now a family favorite. Good old-fashioned sausage gravy. It's her most requested recipe from family and friends alike. Serve over biscuits or toast." Brown sausage in a large skillet over medium-high heat. Set aside, leaving the drippings in the skillet. Mix bacon grease into the sausage drippings. Reduce heat to medium, combine with flour, and stir constantly until mixture just turns golden brown. Gradually whisk milk into skillet. When the mixture is smooth, thickened, and begins to bubble, return the sausage to skillet. Season with salt and pepper. Reduce heat, and simmer for about 15 minutes. See how to make a delicious sausage gravy. We make this almost every weekend. 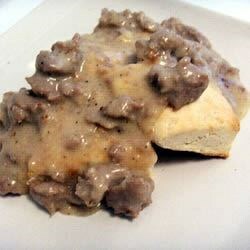 Hubby loves Big Daddy Biscuits (from this site) and this gravy just compliments it perfectly. Thanks for the post.